I’ve been following Steph’s blog thegirlandherbeer.com for some time now. 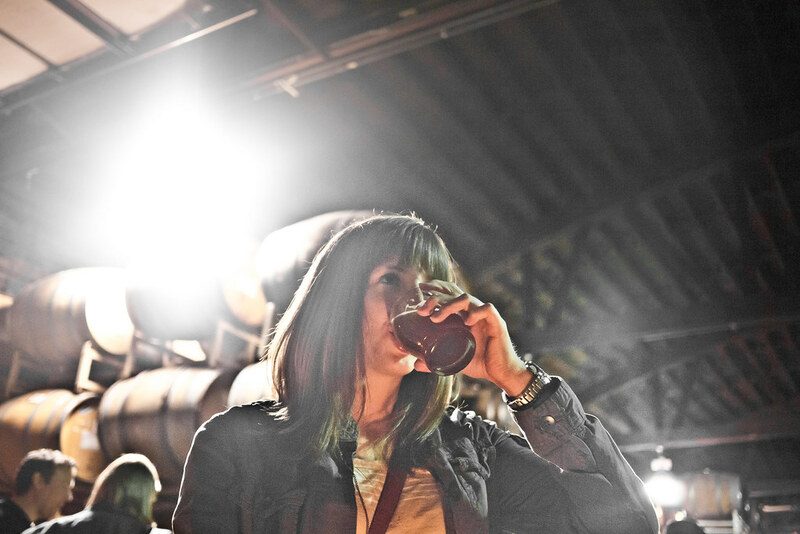 She produces great content, works hard at her homebrew and even shares beer cooking recipes. Daisy Cutter Risotto anyone? I finally got to meet Steph in person at Goose Island’s En Passant release party in April — which gave us a chance to nerd out over beer photography — and she even snuck in a shot of yours truly as though I were a nocturnal animal tripping the wire on a camera snare in the jungle. The nerve. My favorite style is definitely the APA. A lot of APAs offer the same hoppyness that an IPA might have, but they also don’t overpower, leaving more balance between hop and malt. I think you get the best of both worlds without the sometimes ridiculously high ABV. I also really enjoy saisons and farmhouse ales; I’m a sucker for anything that pairs well with a summer day and a hot grill. As for a particular beer, I keep it pretty basic. My anytime go-to beverage would probably have to be Half Acre Daisy Cutter — an APA, of course. Not much, to be honest. I have a real issue trying to keep beer in there because I buy and consume pretty much immediately. I could never keep a beer cellar or any type of collection because I am not able to exercise restraint. I did just buy a couple of four packs from Sixpoint - Resin and Sweet Action. I’m sure they’ll be regulars in the fridge now that Sixpoint distributes in Chicago. Other than that, I’m positive there’s someone who would be impressed with the variety of pickles I have at any given time. New Glarus IPA in 2006. My best friend was moving to Arizona, so of course, we sent her off with a going away party which included the typical kegged collegiate beers. At some point in the evening, my friend’s dad showed me his own personal cooler of New Glarus he was drinking from and insisted I try the IPA. Not wanting to refuse a generous offer (read: I’ll drink pretty much anything put in front of me) I took a sip and I was a goner. Before that, I had only really ventured outside of the macro world by drinking New Castle, Guinness, and Stella — you know, the gateway beers. Ever since, I’ve been trying whatever I can get my hands on, some good, some great, some awful. Brewing my first batch of home brew. So many nerves and paranoia went into brewing the for the first time, so to not only have it turn out well, but to have people really enjoy it was amazing. You know, I really feel as though each deserve the same amount of respect. When done right, brewing beer is an absolute art form, comparable to an Iron Chef’s cooking. To make something with the sole purpose of enjoyment and enriching people’s lives is beyond admirable; especially when it’s done with the right goal in mind; making good beer. At the same time, a bartender is responsible for helping people understand what good beer is. A good bartender will find the right style to convert a beer hater into a beer lover. I find myself dazzled by both. I’m not sure if that’s saying much, though; I’m thoroughly impressed by airplanes. Oddly enough, it was chasing down Sixpoint Bengali Tiger late last year. After reading nothing but good things about these guys, I had pretty much built up an obsession with trying their beers. Last fall, news got out that they would start distributing in Washington DC, which happened to be where I was scheduled to be in November for a wedding. The hunt was on! I got into DC late on Friday night knowing it might be my only chance to patronize a local beer joint. I went to Churchkey, and it was so packed I had to wait outside for a while because it was at capacity. Once I got upstairs, I had to push my way to the bar and asked for a Bengali Tiger. They had just sold the last draft — F#*@. I ended up finding some early on Saturday morning at a Whole Foods. I put it on ice in my hotel room sink and drank it out of a tiny paper cup. It wasn’t glamorous, but it was a successful hunt, and a tasty one at that! I’ve yet to try Goose Island Bourbon County Stout. Anyone willing to donate to my cause, feel free; I have no aversion to handouts. I also didn’t get a chance to sample Half Acre’s Galactic Double Daisy Cutter last summer. Does this make me less of a person?